Famed for his work on over four thousand recording sessions, for playing with the Christian jazz team Koinonia and for his own occasional albums, ABRAHAM LABORIEL is thought by many to be the world's greatest living bass player. Mike Rimmer met the maestro. One of the few perks of being a journalist is that occasionally, just occasionally; you get to meet someone who is a musical hero. As a teenager I discovered the talent of Abraham Laboriel whilst he played bass with some of my jazz favourites. When I got saved, I discovered that he too was a Christian and he played on some of my favourite Christian albums too. Such anorakdom was expressed when a friend and I used to read sleeve notes copiously in the hope of finding obscure recordings featuring Abe's bass playing. I do believe compilation tapes were compiled in tribute and sent to each other! These days it's clear that the man's popularity has spread beyond the confines of such musical train spotting. Recently sighted in the Winans' live band, Abraham's introduction to the audience provoked rapturous and lengthy applause. Meeting the man, it is possible to surmise that his popularity isn't simply due to his amazing bass playing! There is a humility and a love for Jesus which is passionately expressed in a life of worship. Playing music delights Abraham. "I feel very grateful," he confides, "that I have discovered something I love with all my heart and the Lord enables me to do that every day. It's beyond compare. For a long time before I had a personal relationship with Jesus, music was my only spiritual language so every time I had the privilege of making music I knew something was going on that was bigger than myself so it was a great day when I discovered it was a gift from the Lord." Laboriel was raised in Mexico City as a devout Catholic. He moved to the USA to study music at Berkeley College. He studied as a Composition Major at Berkeley specialising in guitar which he had played since the age of six. Bass guitar was not recognised as a "proper" instrument at college because it had no European musical history but his tutors at college allowed him to play bass in his final two years. Laboriel had only learnt bass at the age of 24! Abraham's spiritual journey unfolded as he faced a number of crises in growing up, adjusting to life in the USA and the pressures of being married and having children. He remembers, "When I moved to Los Angeles to start my professional career, I was in such a devastated emotional state that I was contemplating suicide. Then I heard the Lord telling me I was a hypocrite because I wanted the Lord to change everything to my liking but I was not allowing him to change me! The next morning I went to church and spoke to the pastor. He invited me to kneel down and invite Jesus into my heart and from that day my life was completely changed." That was 11th October 1977. Laboriel had moved to LA the previous year and his wife Lynn had become a Christian. For a whole year she had quietly prayed for him every night after he was asleep. In his working life and in his spiritual life, things were taking off. He was beginning to make contacts and the sessions were beginning to roll in. Initially Abe had a reputation as a first class jazz player but he soon spread his wings in other directions. Thinking about his working life, Abraham says, "I've been blessed in ways that are exceptional. One of my teachers at college recommended me to play as part of Count Basie's orchestra to back up Johnny Matthis. He liked my playing and six months later he hired me to go on the road. Pretty soon I was active all the time, initially playing with Henry Mancini, Olivia Newton John, Greg Matthieson who still produces my solo albums. It's all the blessing of the Lord." Laboriel's first recording session in Los Angeles in 1976 was backing English singer Leo Sayer. Also playing on the session were Jeff Porcaro and David Paich (later Toto) as well as Larry Carlton and Michael Omartian. Laboriel remembers it well, "Man, it was unbelievable!" He enthuses, "Me and Michael Omartian realised we both went to the same church. I didn't realise he was a Christian but the conversation naturally floated towards the Lord. I started to go to a prayer group in his house." Slowly but surely Abe began to work in the growing Christian scene. Originally Omartian invited him to work with 2nd Chapter Of Acts and in the process he met drummer and producer Bill Maxwell. One morning Laboriel was feeling depressed. He remembers, "I prayed and asked the Lord that if he was really, really real, I wanted him to prove it to me which is a very dangerous thing to do! That evening when I was in a recording session, Bill Maxwell showed up and introduced me to Andrae Crouch and that night we went to perform in front of President Ford in Los Angeles. I met Hadley Hockensmith and Harlan Rogers and from that day on my life was enriched forever because we started to make Christian records produced by Bill and Harlan and later Koinonia was born." These connections meant that Laboriel played on some of the most significant Christian music of the '70s. I ask him to reflect on his work with Andrae Crouch. Abraham considers for a moment and then responds, "It's a tremendous humbling privilege to be part of something that endures. When we listen to the stuff we did in the '70s, it still sounds alive. The Spirit of the Lord is in the music, the playing, the words and it doesn't sound dated." In the last 20 years, Laboriel has played in over four thousand recording sessions taking in everything from Pavarotti (!) to Keith Green. 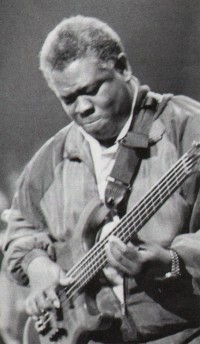 Laboriel played on the majority of Green's classic recordings, making music with a spiritual impact 15 years after Green's death. Life in the studio with Green was no bed of roses, as his way of working was at odds with Laboriel's method of playing. To understand the tension, it is important to understand something fundamental about Laboriel's approach to making music. Abe explains, "I am acutely aware of the Lord's gifting in my life. There is a famous jazz bass player called Steve Swallow who was teaching at Berkeley and he literally told me I had a built in resistance to believe that music is a system. He told me that every time I play it's the first time. Most musicians have an approach towards music which is cumulative. He dismissed me by saying I had a unique perspective which had nothing to do with the way most musicians approach music! I was devastated by that assessment but little by little I learnt that in the hand of the Lord it was a really great gift." That gift, however, could also lead to tensions when it came to recording sessions. "It's not a lack of discipline in that I don't care! I try hard to do what people need me to do. If you analyse how I change from take to take and how that doesn't drive people crazy, you know the Lord is involved!" Remembering working with Keith Green Abe says, "Discipline was not my forte. Keith soon realised that my lack of discipline came from a right heart. It was a challenge to him to let the gift of the Lord in me be a strength to him. A lot of his toughness and inflexibility..." Abe breaks off to chuckle at the memory. "The Lord used me to bring Keith to a place where he let go and just trusted that I was not necessarily ruining his songs by my own will but I was bringing something to his music. We would work for long hours on the songs until we were all satisfied. In the process Keith would have to let go of his controlling habits. Literally I was the wrong man to force to be consistent because every time I play my instrument I approach it as if it was the first time ever. So even though we do the same song for several hours, every take was a whole other world!" You would never guess that a man who is one of the best bass players in the world could ever suffer from insecurity, but he did. "When I was in school in Boston, my English was poor and my Mexican musical training was poor. I was at a disadvantage which caused me to be in tears most of my four years at school! I think my being so upset that I couldn't measure up to what I thought was the standard of the USA allowed the Lord to shape something very special in my life towards music. I had the awareness that music was a gift from him. It was intended to be used for his glory and to influence other musicians to not be so tormented by their desire to make great music." I grew up listening to integrity music; albums of worship leaders like Don moen amd Ron kenoly etc. The bass lines from those albums are synonymous to Abraham laboriel. He strongly influenced my style of play. I have never seen such passion,humility, spirituality and gift in bass playing.He is the Best. Thank you very much Sir for being a blessing to our generation. I can relate to him! I love playing with all my heart to the Father who sent his Son to die for me and rise again! I too love the blues/jazz rhythms, and playing and singing with everything that is in me before Almight God and Father of my Lord Jesus Christ!! I relish Abraham's dexterity so much on how he plays the bass such that I was always having this esoteric believe system about him.he remains my inspiration and mentor in the business of bass guitar..will find it highly exhilarating if I will meet him some day....may GODBLESS nd keep u till a full grown age and make you rapturable too.luv you sir Abraham. Wow this is mind blowing. I just took time to brows if he is dead or alive and i stumbled across this interview. Sincerely i got captivated, inpired, and also encouraged. I play bass guitar too, may the Lord help us to be humble and ministers indeed. I love you Abraham. i really fell blessesd by interview. Sir Abe may the lord continue to bless. Sir u've a lot to my bass playin for 4 years now because u got me inspired by ur playins right from when i was very young. So thank u sir. I'm inspired to read Abe's interview. Having reading what God has used this great Bassist of time to do, the creativity in him realy inspire me alot. How i wish i can perform atleast two percent to what he those. Please i wil like to know whether this man is still alive becuase so much romours that he's not alive. Please confirm it for me. Thanks. I LOV MA FATHER SIR. ABE. I SURVIVE AND INFLUENCE PEOPLE BOTH MUSICALLY AND SPIRITUALLY BECAUSE HE INFLUENED ME FROM MY TODLER STAGE. I'LL GIVE MY BEST 2 D GLORY OF GOD. Do You Have A Pit Bull Attitude?